Spice the turkey with salt and pepper and brush it all over with oil. Fill the cavity with the crushed garlic, rosemary, lemon halves, thyme, bay leaf and sage. Heat up the oven to 350°F and fry the turkey approximately 2 1/2 hours. To prepare the glaze mix up the apricot jam, lemon zest, lemon juice, season and sage with salt and pepper in a small bowl. Heat the mix in the microwave oven. Rub the turkey with the glaze and fry it for 30 minutes at the temperature of 175°F. 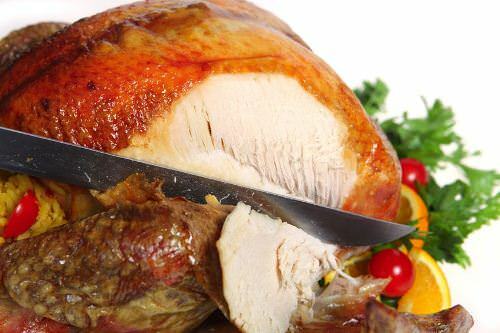 Remove the juice from the cavity to a frying pan and leave the turkey on a cutting board for 45 minutes. To make the gravy, put the fat from the drippings to the frying pan, add turkey stock and cook for 2 minutes. Melt the butter in a saucepan, add the flour and cook for 2 minutes. Add 3 ½ cups of the liquid from the frying pan and cook until it gets thick. Spice the gravy with salt and pepper. Cut the turkey and serve with the gravy.